Location: Mulebone Restaurant 2121 14th St. NW Washington, D.C. 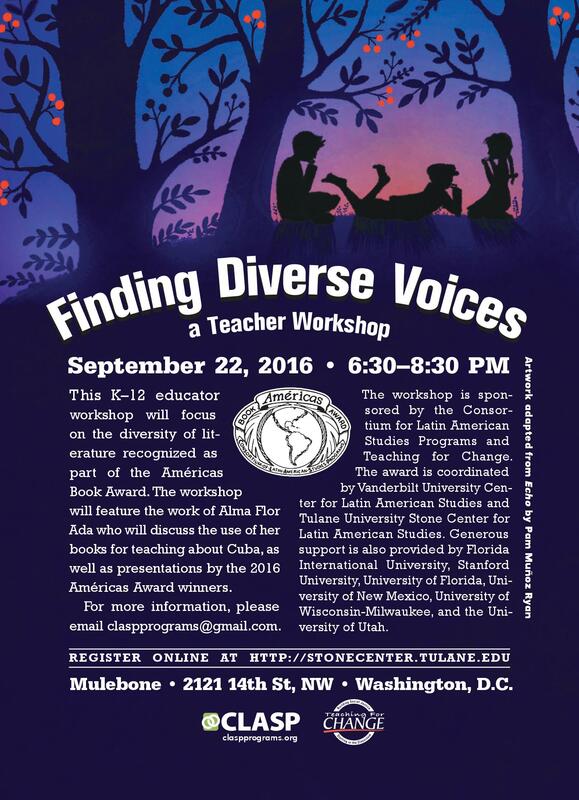 This workshop will focus on the diversity of voices available for children’s literature. Alma Flor Ada, author of Island Treasures on this year’s commended title list, will discuss how to use her book, and others she has written, in the classroom. 2016 award winner author of Out of Darkness Ashley Hope Pérez will present teaching resources to use alongside her book. This workshop includes dinner, a copy of Echo, Out of Darkness, or Island Treasures, bookmarks, Continuing Education Units, and lesson plans. This workshop is co-coordinated by CLAS and Tulane University on behalf of the Consortium for Latin American Studies Programs (CLASP). 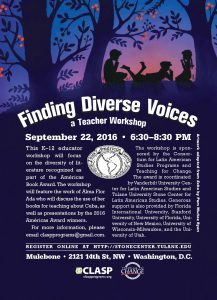 This workshop is co-sponsored by Teaching for Change. See more information about the workshop and related resources here. Registration: Fee: $25. Includes all materials, dinner, a copy of Echo, Out of Darkness, or Island Treasures and Continuing Education Units (CEUs). Follow the Americas Award on Facebook or join the conversation at #AmericasAward16. Location: The Library of Congress, Washington, D.C.